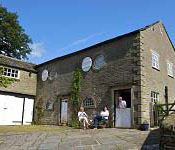 A range of beautifully restored Kerridge stone buildings providing three prize winning self catering holiday cottages. A guest commented to the webmaster that these cottages are ‘… of superior quality, beautifully fitted out! The best we ever stayed at!‘ The cottages are graded 5 Star Gold by Enjoy England and were winners of Northwest Tourism for All Award 2009, Cheshire’s Self Catering Holiday 2009, Cheshire’s Access for All Tourism Award 2009, Highly Commended Cheshire’s Sustainable Tourism Award 2009 and Marketing Cheshire Self Catering Holiday Provider Gold Award 2014. Gold Award winners for Green Business Tourism Scheme. Tripadvisor Certificate of Excellence 2015. Wonderful walking country with miles of well kept footpaths plus access to so many local attractions, and probably the best selection of eating pubs and restaurants to be found within a few miles anywhere. The Hayloft has been assessed as M3a by the National Accessible Scheme. The Stables has been assessed as M1 by the National Accessible Scheme. Finding it: On the B5470 road from Macclesfield to Rainow, the first part of the village is Kerridge End and the cottages are on the left between Calrofold Lane and Lidgetts Lane. Access is from the little lane, Lidgetts Lane (best approached from the Macclesfield side if you are not familiar with it), round the sharp left corner and the entrance to the car park is 10m on the left.